Berl (mother's uncle), Father, Mother, I, my two brothers and my three sisters, are sitting on the wagon, on the way to Olshani. It is cool. The month of Tishrei is almost over. We are on our way. Uncle Berl has a horse and wagon and he is inviting us to stay at his home. I am sitting on the wagon not worried at all. Someone else should worry. It is a bit chilly. It is drizzling. We are between Yom Kippur and Sucot. I hold my beloved sister Gitke's hand to feel some warmth. We are hungry, but Olshani is close. We'll be there very soon. I think I slept during most of the trip.I do not remember whether other wagons were going there. It makes sense to assume so. You have to understand that I was a little girl, the youngest in the family. I remember that contrary to everybody, I loved this travel. In my eyes it was like a trip, but an unhappy one, because my parents were sad and so were my brothers. We arrived towards evening. In the evening it is dark. There is no electricity, therefore I think it was towards evening. Many German soldiers were outside. The family of uncle Berl received us for dinner. I remember aunt Rivka, Berl's wife, even offered us bread and tea. There were only two rooms in the uncle's house. We got one room and one bed. We spread blankets on the floor, and that is how we passed the night. Next morning I woke up in a house which is not my own. All of us are hungry. From now on we were hungry all the time. We prayed Shachrit and ate a thin cereal that Mother prepared. Food was difficult to get, even in the flourishing black market. If you got a piece of bread, you had to hide it well. Our situation is quite bad. The Germans rationed food. 200 grams bread per person. Can you be satiated with this? Some sold their last piece of bread in order to buy something else. When there was no bread we ate turnips. It was called "Brotzke". My uncle was given a nickname "Der Keisar". Why "Keisar"? because "Lebt Vi A Keisar" (lives like an emperor). The uncle ate better food than we did, and we could smell his meat cooking very often. Mother was almost always cooking without meat. The uncle used to make fun of her by whispering, whenever she would place the pot on the fire, "Fosene Babkes" (potatoes without oil). …Except the constant hunger which accompanied us, we were children. In the first morning, all kids went outside to play. German soldiers were in every corner. Olshani was the border and they had to guard it from the Russians. I paid a lot of attention to the special shape of the houses there. 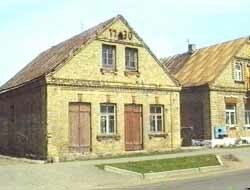 I remember the "Shtreiendike Dechalach" (straw roofs) and the enclosed porches. Each house had a wooden porch sticking out, enclosed by glass windows. In fact, as kids we had nothing to do, no studies and no other occupation. From day one I especially loved playing with the muddy soil. This mud was actually a special quality clay. I had a girlfriend with whom I built various sculptures. 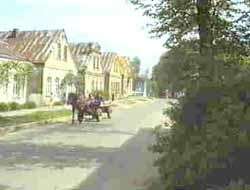 Near Berl's house lived his daughter and her six children. She had three boys and three girls. Sometimes my sisters used to sleep there. 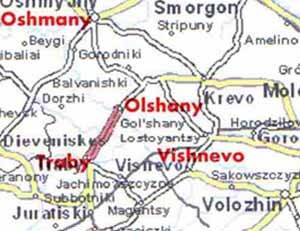 When we arrived to Olshani, the daughter was in Vilna. At this hunger period, she used to go to Vilna to buy "Alte Zachen" (used clothing) and bring it back to Olshani, where it was in high demand. This meant that she had bread and that she could earn a living. There was a lot of tension in her home. Her husband was in America. It was common in that time. First the head of the family goes, finds a source of living, and then brings his family. However in the meantime, the war broke out. In the time we lived together she did not receive any letters from him. Berl's daughter had a very handsome son, Chatzkale. Even the German soldiers liked him. What did they do? They sewed a small soldier uniform for him and even prepared a small rifle, all for photography. They used to take pictures with him, and mailed it to their families. On a winter Friday, in early evening, I was left alone in the house. Father and mother were not there. They were looking for food. My sisters were in the house of the "Keisar" daughter. I was bored. What did I do? I went out barefoot and began dancing on the snow. What can I tell you? I got a high fever and "Klezmorim" began to play in my throat. Mother began running from doctor to doctor and from "Felsher" to "Felsher" (knows a little bit about medicine and about first aid). My brother, Leibl, who was on a Shabbat leave from his "Panni Battalion" (forced labor) joined mother's running around. My father did not go. He was always spoiled, he always did not feel well. How can I tell it to you, he "Gekrechtzet Di Gantze Tzeit" (was sighing all the time). Each doctor said that I have only 15 minutes to live. I remember I was searching for air and could not find any. They told us to go to the synagogue which became a hospital. A transport of wounded soldiers arrived there, and probably they have medicines against Diphtheria. When we arrived there, they accepted us immediately. Leibl knew German very well and knew how to talk with them. As soon as I got the shot I could breath again. I was instantly relieved. All the soldiers near our house knew about my problem. When we arrived home the soldiers began shouting, "Luft, luft, the girl needs luft (air)," and told mother to open the windows. Mother begged them not to do it, but they broke the windows, and we slept the whole night with snow, cold wind and broken windows, freezing, mother crying and my heart is with her. Next day the glass windows were repaired by glaziers. The doctors told me to drink something sweet, jam or even sugar. But, as you can imagine, you could not get these items even with money. So I never got it. Upon return to Vishnive, at the end of the war, they added to my name, which used to be "Dvoshe", the name Chaia, "Tzom Leben" (for life), and since then my name is Chaia Dvoshke.